Our Diamond Plate, also known as Tread Plate, is made up of lightweight .100" Thick Aluminum. Light and durable, its raised diamond pattern helps provide traction and adds an aggressive touch to your trailers appearance. Twice as thick as our normal diamond plate fenders. This fender has a 1" radius lip on the front and back to provide universal mounting to either side of your trailer. There are no pre-drilled holes. 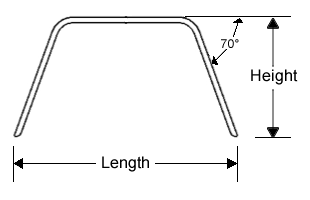 These Fenders are typically mounted using a pre-existing mounting bracket. These fenders are American Made, and provide an excellent option for your trailer. This fender is 40"x12" made with .100 Diamond Treadplate aluminum and provides protection for single axle trailers. They have a raised diamond, bright aluminum finish and come shipped to your door in a durable package. I am building a teardrop trailer with off road tires and a recess in the frame. This unit was 40 inches and I was able to fit in my 39 inch opening with minimal mods.